The European machine vision industry grew by 10 per cent in 2016 – the same growth that was seen in 2015 – according to the incoming order and turnover statistics of the VDMA. Evidence of this can be seen in the 2016 fourth quarterly reports of key players in the imaging market. The machine vision industry in Germany and Europe has been reporting high growth numbers and record sales figures, with the German industry alone achieving a record turnover of €2.3 billion in 2016, an increase of 11 per cent. According to the VDMA, sales in the vision industry as a whole more than doubled between 2005 to 2015. Part of this growth has been attributed to machines and robots learning to ‘see’ using vision systems. ‘Within the global race towards greater automation, this key technology is not just found in traditional industrial sectors, but is conquering brand new areas too,’ the association stated in a press release. 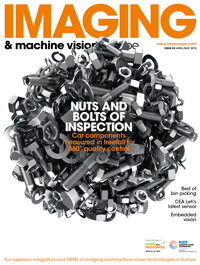 It highlighted that non-manufacturing applications are now benefiting from the improved quality, greater reliability, increased safety and cost-effectiveness of machine vision technology as much as industry. More details on products, markets and applications, and a more precise growth forecast will follow in June 2017, when the final results of the VDMA annual market survey machine vision are available.